While there’s a number of factors that go into what shows up in your newsfeed, the one that seems most powerful is engagement. What do I mean by “Engagement”? Comments, Likes, and Shares. They’re like votes for your post. The more you get, the more people tell Facebook that this post is important and worth seeing, and the more they show it to other people. It will immediately show up in newsfeeds of a few of your fans, and if they engage with it, it’ll show up in more. If they don’t do anything to it, this tells Facebook that it’s not very important and that it’s not worth showing to other people. So how does this compare to “Promoted” posts? Last week I ran a promoted post. I paid $10 to promote it “up to 2400” people. 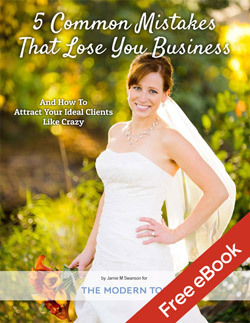 It was a free boudoir posing guide that my friend is giving away on her new blog, so I thought it’d be something that people might be interested in. You can’t see it here because the stats cover it up, but it had 14 likes, no shares, and 1 comment from me and I had 1273 unique people who saw it. 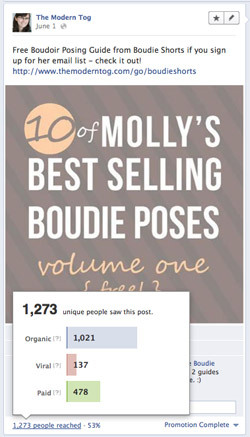 Very little engagement, so nowhere near the 2400 people I could have potentially reached with my $10 promote budget. Let’s compare that to a typical post on my blog where I had better engagement than on the promoted post above. 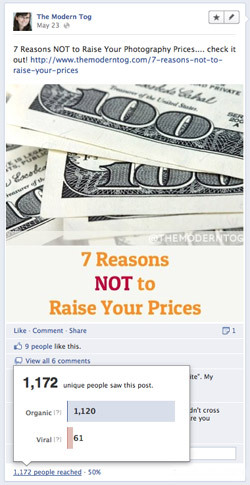 This post was simply an image that linked to my blog post about 7 reasons you shouldn’t raise your prices. This post got me 1172 unique views, had 1 share, 9 likes, and 6 comments. It reached 50% of my audience – barely less than what the promoted post had reached. Because the promoted post got very little engagement, it didn’t go very far even with the cash I threw at it. It would have been even worse had I not promoted it at all. However, this post did almost as well without paying to promote it because people were engaging with it. I wanted a way to show you how powerful engagement could be, so as I started writing this blog post, I posted a status update to my Facebook page asking people to like the post and comment about where they saw it (see exact wording below). While this didn’t get me any shares, it got me a LOT of engagement in a very short amount of time. You can’t see it here, but there’s 128 likes and 83 comments and no shares. So far, 2321 unique people saw this post, and my page only has 2035 fans altogether. So more people have seen that post than I have fans, and it’s still very early in the lifespan of that post. So if you do any math in your head, you may be looking at the 39% statistic next to the number and wondering why it’s not over 100%. This is where things get REALLY interesting. The 39% represents the percentage of my fans who have seen the post. This means that Facebook is showing my post to more than just my fans. In fact, I even picked up 2 new fans from that post because of it. “Like”. If you look closely, the statistics show 2 or 3 different categories depending on if you promoted the post or not. When you hover over the number of people reached, you’ll see how many were fans (Organic) and how many were friends of your fans (Viral). If you promote these posts, you’ll also see a paid statistic showing the extra views you paid for. The Viral views are the people who see it even though they haven’t liked your page to become a fan. One or more of their friends are fans, and Facebook thought maybe they’d like it too because of that. On the 3 different posts I posted above, the viral views were just small percentages of the overall number of people who saw the post, except on the post that had tons of engagement right away. 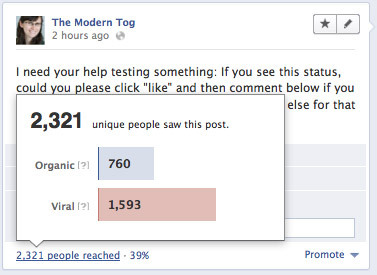 In that case, the viral views were much higher than the organic views. This means that the post was shown to more people who AREN’T my fans than people that were my fans. So the key to getting lots of extra people to see it is to get lots of engagement on the post right away after it is posted. This tells Facebook that this post is “hot” and that people other than just your fans may want to see it as well. So how do you get people to engage? The easiest solution? Ask them to. If you like this photo, please leave a comment, “like” it, or share it on your wall. I got 3 shares, 51 likes, and 7 comments. Not too bad at all for a page with only about 500 fans. Beyond asking people to engage with your content, it’s also important to be providing people with lots of value. If all you ever post about is some sale or other self-promoting stuff that doesn’t really matter to your fans, it’s only going to hurt you in the end. I highly suggest checking out this post about what photographers should post on Facebook from Zach Prez. It’s full of great ideas. Also, make sure you’re posting when people are actually online. If you post at 3am, no one is going to be there to see it and engage with it, so you’re going to lose a lot of potential engagement simply because of when you posted it. While there is certainly some benefit from promoting your posts, and more people will end up seeing it, you’ll actually get even better results if you can find a way to get more people to engage with your posts. So I highly suggest doing everything you can to get people to engage as much as possible. If you’re not getting engagement, you’re not going to get much extra results even if you do promote the post. Engagement is just TOO key in what shows up in newsfeeds. So, now that you’ve learned the secret to showing up in the newsfeed, I’d highly appreciate it if you would like my Facebook page and engage with the posts when you see them come through your newsfeed. I’d appreciate it immensely! Thanks! Are you also on Pinterest? Why not pin this article as well. It only takes a moment. Thanks!